Siva Therapeutics’ goal is to develop the next generation of interventional oncology that is less invasive, safer, more effective, less costly, and more practical than current cancer therapies on the market. Currently, cancer patients face treatments that are invasive, risky, disfiguring, moderately effective at best, and very costly. Siva’s approach is to use SivaRodsTM gold nanorods and SivaLumTM infrared light device to destroy solid tumors using Targeted HyperthermiaTM and improve patient health and outcome. To learn about our approach and technology, visit our technology page. Watch Siva’s CEO Len Pagliaro present at Breakout Labs Unboxing event! Siva Therapeutics is developing an elegant, safe and effective cancer treatment termed Targeted Hyperthermia™ (THT), which generates therapeutic heat within solid tumors using SivaRods™ gold nanorods and a SivaLum™ infrared light device. THT has multiple beneficial effects on tumors, and it is more selective than chemotherapy, less destructive than radiation, and without the risks of surgical treatment. This treatment promises to be minimally invasive, to reduce harmful side effects, and to stimulate the immune system. In addition to being more affordable, this technology could deliver faster results than current cancer treatments. Vision: To develop new cancer therapies that will save lives and not be dreaded by patients. Mission: To develop a minimally-invasive, practical, safe, cost-effective, and efficacious device therapy for cancer using proprietary nanotechnology. To bring to market a product that will improve the efficacy of current cancer treatments and provide another tool for oncologists. To build a company that will gain and maintain a leadership position in the market for device therapies in cancer treatment. According to the National Cancer Institute, cancer therapies are currently limited to surgery, radiation, and chemotherapy – all of which risk normal tissues or do not effectively eradicate the cancer. Innovations in nanotechnology aim to direct therapies directly at cancer cells, resulting in a targeted approach to treatment. Siva Therapeutics is dedicated to becoming a leader in nanotechnology cancer therapies and we are rapidly developing innovative nanotechnology approaches for the treatment of cancer. SivaRods: each gold nanorod is approx 12x50nm and only viewable with an electron microscope. Targeted Hyperthermia is an interventional oncology approach which employs the systemic injection of polymer-coated gold nanorods (SivaRods) into the patient and illumination of the affected region with a near infrared light device (SivaLum). The SivaRods concentrate in tumors, absorb the infrared light, and convert it into therapeutic heat which emanates from within the tumor mass. Heat stimulates the immune system, shrinks tumors, and also enhances drug efficacy. 2) targeted hyperthermia, in which infrared light is used to heat the nanorods, thereby destroying tumors while leaving surrounding tissue relatively unharmed. Heat can destroy cancer cells. The challenge in using heat effectively has been to direct the heat to the tumors without damaging adjacent healthy tissue. Precision nanorods solve this problem. Nanorods are preferentially absorbed and retained by vascular tumors, and can direct heat to the tumor tissue. 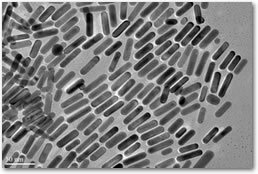 First, SivaRods nanorods can be manufactured with a higher degree of precision than other gold particles, resulting in a much narrower size distribution, and much higher dimension uniformity. Second, SivaRods nanorods absorb infrared radiation, and re-emit this radiation as heat, permitting photothermal heating of targeted tissues. Conventional gold particles are roughly spherical in shape, and they absorb (and re-emit) shorter wavelengths of light, rather than infrared, eliminating photothermal capabilities. In fact, the wavelength at which SivaRods nanorods absorb and re-emit light can be precisely tuned by regulating the length of the rods. Important to our work is the delivery of methods and technology that improve patient health and outcomes once faced with cancer.